Explore las principales atracciones a lo largo de la ribera central de Londres en este tour en bicicleta de 5 horas por el río Támesis. En esta excursión para grupos pequeños, vea los lugares de fama mundial que bordean el río, como el Big Ben, el Teatro Globe de Shakespeare y la Catedral de St. Paul, cruce el Tower Bridge y disfrute de las delicias internacionales en el Borough Market. Mientras viajas, disfruta de comentarios interesantes sobre la rica y extensa historia de la ciudad. Por la mañana, conozca a su guía local en el centro de Londres y emprenda un paseo en bicicleta por el siempre cambiante río de la ciudad en la orilla del Támesis. Debido al formato de grupos pequeños, su guía diseñará un itinerario personalizado que se adapte al grupo en función de las preferencias y la capacidad. Sea cual sea el camino que tome, verá las principales atracciones como el Big Ben, el London Eye, la Catedral de San Pablo, el Teatro Shakespeare's Globe y la Torre de Londres. Después de cruzar por South Bank, se detendrá en el bullicioso y ecléctico Borough Market. Además de ofrecer una cacofonía de productos alimenticios artesanales y hermosos productos, este mercado es un testimonio del paisaje multicultural de Londres. Para el almuerzo, tome un poco de pescado y papas fritas crujientes, una envoltura de falafel de Damasco o una olla de fideos calientes al vapor con ingredientes personalizados (por su cuenta). A continuación, suba a su bicicleta para deshacerse de su abundante almuerzo. Diríjase al icónico Tower Bridge, una obra maestra de la ingeniería victoriana. Al cruzar el puente hacia el distrito financiero de Londres, admire las vistas panorámicas del río que presentan una yuxtaposición de la arquitectura antigua de Londres y construcciones modernas como Shard, una pirámide de cristal de 95 pisos. En el camino, disfrute de una narrativa de su guía sobre los principales eventos, desde plagas y guerras hasta incendios catastróficos, que han evolucionado el paisaje urbano. Pase el Monumento al Gran Incendio de 1666 y el extraordinariamente bello mercado de Leadenhall, el escenario de muchas películas que incluyen a Harry Potter y la Piedra filosofal. Luego pedalea sobre el puente de Londres de regreso a Southwark, donde tu recorrido termina a media tarde. We wanted to take a tour of London without sitting on a bus and found the Small Group Bike Tour to be just perfect! 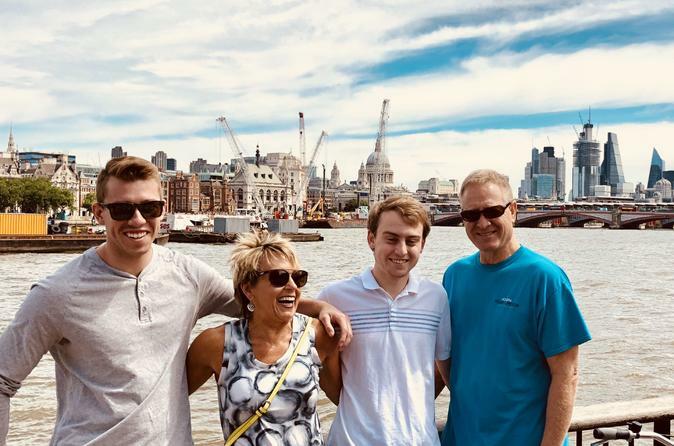 The group of 16 was split into two groups of 8 which made it easy to navigate and stay together through the narrow London streets. Joe, our guide was very polite and knowledgeable of all the points we visited. 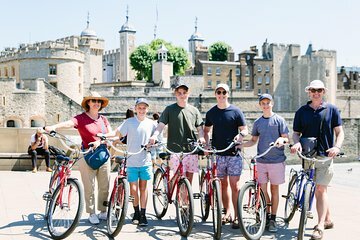 The ride was very pleasant and we enjoyed stopping to discuss architecture, historical significance of certain areas and buildings and the fascinating history of London. I would highly recommend this tour to anyone who would prefer covering a lot of historical facts while sightseeing some iconic and off the beaten path sights in London. What a way to see London. Our guide was a local Londoner which showed how much he enjoys his city. We really enjoyed this trip with Jonathan. Went to a lot of interesting places. Very easy on the bike. Of course we had great weather. Jonathan was very informative and entertaining, he made history very interesting. Well worth it and great value for money. The tour itself was very good. The stops were unusual and the guide, Nick, informative. But, there is no easy way to get around London on a bicycle with all the foot traffic A lot of the ride was spent weaving around walkers in tight spaces. Loved it! Great guide Matt(I think) actor from Australia. Felt safe and was great to see London at twilight. This bike tour was fantastic. Our guide was wonderful, shared great information and history, and he always offered to take family photos of anyone! Definitely recommend this tour to anyone who wants to get a great overview of London. You should consider doing it at the beginning of your vacation so you know where to spend your time. Great, great ride and overview of London. Our guide...I beleive Beth was her name...was superb. Great overview of the trip including sites, traffic observance...riding on the LEFt side of the road : cause it's London, ensuring our young riders were close to her for safety. She was just great and made this crowded city very easy to navigate for us. Excellent history lesson, lots of river stops, and we rode ACROSS Tower bridge. Amazing for sure. And a yummy lunch stop in Borough market. highly recommend. Our guide, Thomas, was delightful. I don't call 11 riders a small group. We found ourselves riding on walkways crowded with many pedestrians, which got very stressful. This distracted from seeing the "sights" between stops.